On October 15, 2009 we had our first appointment with Rehab Institute of Chicago (RIC). You can read about this visit at The Process Begins for a New Wheelchair. On November 5, 2009 we had our second appointment with RIC. I wrote about this visit at The Wheelchair Process Continues. One week after the second visit with RIC we checked with the medical supply company about the Letter of Medical Necessity only to be told that the person in charge of creating the Letter of Medical Necessity, which will be forwarded to my doctor for a signature, had to unexpectedly take some time off work. I understand that the unexpected happens so decided to wait another week and check on the progress of the Letter of Medical Necessity. On Thursday November 19 I sent an email to the person in charge of the Letter of Medical Necessity to check on the progress. I received an email in reply stating that they are still waiting for the physical therapist from the Rehab Institute of Chicago (RIC) to send them the Letter of Medical Necessity. They told me that they would send RIC an email asking about the progress of my Letter of Medical Necessity. On Friday when my wife P. followed up with RIC by phone, she was told the person who was to write my Letter of Medical Necessity had taken the day off work. It has been two weeks since we were at RIC finalizing what I needed and which wheelchair best fit my medical needs and now I find out that nothing has been done about sending my doctor a Letter of Medical Necessity for her signature. I wonder if we hadn’t followed up with the medical supply company how long my request would have sat on someone’s desk with no progress. Even after the medical supply company receives the Letter of Medical Necessity from RIC, they have to send it to my doctor’s office. After the doctor signs the letter it must be returned to the medical supply company. Then they must create a document containing the Letter of Medical Necessity and a quote for the wheelchair. The insurance company must decide if they will pay for this new wheelchair or not. If the insurance company approves the request, the medical supply company creates an order and sends the wheelchair order to the manufacture. Because these wheelchair are all custom built, the order is placed in their wheelchair build queue. As you can see there are many, many stops in this entire process where the wheelchair request can either be lost, or just sit on someone’s desk waiting to be uncovered. At the risk of being labeled a pushy pest, I will continue to keep a close eye on the progress of my new wheelchair request. On Thursday Nov 5 we returned to the Rehab Institute of Chicago (RIC). This time the people at RIC had finished their research and had a wheelchair they wanted me to try. They had considered our concerns about having a wheelchair that would work in our house. We had a number of specific concerns. Would a different wheelchair still allow me to get to the shower? Would a different wheelchair make it possible for me to remain in the chair all day? Would a new wheelchair allow me to have both the ventilator and humidifier mounted on the wheelchair? Currently I must transfer from my wheelchair to my recliner and back to the wheelchair a number of times during the day. Having both the ventilator and humidifier mounted on the wheelchair would mean I wouldn’t need to connect and disconnect the humidifier from the ventilator every time I transferred. Both connecting and disconnecting the humidifier and transferring are becoming a safety issue. Finally we had a concern about being able to use the new wheelchair in our existing van. We were both pleased to see that the wheelchair they thought would work for us had a slightly shorter footprint. Also the seat height from the floor appeared to be about the same as my current wheelchair. After spending some time reviewing and addressing our concerns they wanted me to transfer to the new wheelchair and take it for a test drive around the hallways. I was pleasantly surprised; the new wheelchair was much more comfortable than my wheelchair. This is important because one of my goals is to be able to spend my day in the new chair and for that to happen the new wheelchair must be at least as comfortable as my recliner. After spending about one hour in the new chair while discussing additional options, things like a laptop computer tray, I would need on a new chair it was time to transfer back to my wheelchair. I really didn’t want to transfer. One reason I didn’t want to transfer was I had reached the end of my energy level and was totally exhausted. Another reason was that my wheelchair isn’t a comfortable chair, when we got it 7 years ago; the sales person hadn’t order the correct length seat. Also my health condition has changed, I have gained weight, must use a ventilator, have trouble seating upright plus many other health changes. All combined contribute to making my wheelchair uncomfortable. After spending about 2 hours at RIC, they had all the information they needed. Now they write up everything I need on the new wheelchair and send a letter containing the new wheelchair specifications to my neurologist for her signature. After receiving the neurologist signature they submit everything to our health insurance company for their approval, something I hope we receive. Once they have received the insurance company approval they will order the wheelchair from the manufacture. Then once they receive the wheelchair from the manufacture they will make the additional modification to the wheelchair for my special needs. They told us that hopefully sometime in February 2010 I will receive the new wheelchair. After I have the new wheelchair, I must contact my handicapped van manufacturer and have them come out and install the electronic locking system for the new wheelchair in my van. So as you can see, we are only at the beginning of an extremely long process. Late Thursday afternoon our oldest son C, daughter in-law K and grandson L arrived. They were spending a couple days with us because L had a couple of days off at his school. Because they arrived shortly before supper and because L was tired, he and I didn't do much on Thursday. Friday morning I got up at my usual time and tried to not make a lot of noise downstairs by using my wheelchair at a very slow speed. However, I was just turning on the coffee maker when I felt another presence in the kitchen. I turned around to see that L was up and ready to watch some morning children television shows. 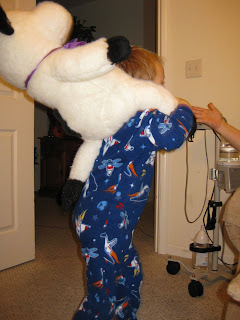 He had our youngest son rather large stuffed cow sitting on his shoulders. I poured my coffee and the two of us went into the den. It was about 6:30 in the morning and L isn't allowed to turn on the television before 7 AM. I wrote my usual morning email that I send to my entire family and extended family. And I read my emails, checked the local newspaper and drank my coffee. L spent the time looking at some books and asking me if it was 7 o'clock. Poor L had a hard time keeping quiet and staying settled down. After all this past Friday was when he, his parents and his grandmother were all going to a LEGOLAND Discovery Centre and I think he thought everyone should be up and getting ready. In fact everyone did get up and they all were on their way shortly before 9 A.M. They spent most of the day at the LEGOLAND Discovery Centre arriving home just before 5 P.M. As soon as they all were in the door L asked his father to help him put together the Lego kit he had purchased at the store. So while Grandma made supper, L and his mother and father sat on the den floor and assembled a Lego race car. L had slept most of the trip home, so after supper he spent time in my bedroom setting in my wheelchair while I was in bed. There the two of us spent the next 1 ½ hours watching television. He would constantly make comments on the shows or would ask me questions about the show which I tried to answer using one or two words. I think L has a difficult time figuring out why his Grandpippy doesn't talk much. Saturday morning we all woke up to a nice partly cloudy day. 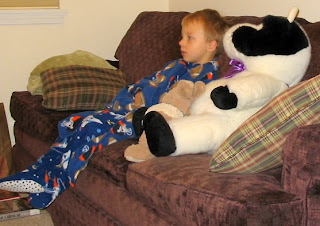 Once again L and I watch television while waiting for the rest of the family to wake up. Now on Friday we had receive a couple of inches of rain making it a great day to spend indoors. However, now with the better weather L and his Grandmother decided to go to a local orchard. Son C and daughter in-law K stayed home with me. I did my normal routine of doing Sudoku and jigsaw puzzles while they spent the morning relaxing. Late Saturday afternoon our daughter and son in-law and some friends with their two young kids came. After a light supper, everyone went out Trick or Treating. They went down one side of our short street and back up the other side arriving home with each of their pumpkin buckets filled to overflowing. However, before they went Trick or Treating L had to have his Uncle K take his Lego race car apart and rebuild it in a different race car model. By mid morning Sunday everything was back to our normal live again. 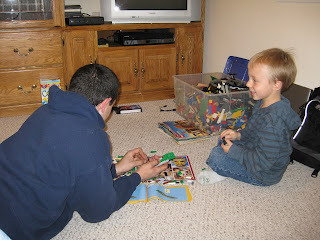 I however had a Great Lego weekend.